As long as I am catching up, here's information from a newly discovered distant relative who turned up in Walter's researches. He is Shmuel Elhanan, and is a descendant of Binyamin Rubinowitz, the fourth child of Rabbi Isaac Elchanan Spektor. That makes him our fourth cousin. He lives in Rehovot, Israel, with his wife Zippora. Walter discovered him while preparing for his trip to Lithuania, when he was told that another Spektor descendent had made a similar trip some years ago. Following are two emails that Shmuel sent in response to Walter's inquiries. It was most interesting and touching to receive your mail. As you are asking for quick reply i am doing so and might be a bit short. We live in Rehovot since 1958, when we came there with our son Binyamin, two weeks old, as my wife came to the Machon as a Postdoc. My two brothers were sent to Palestine in 1940, from Kovno, at the age of 13 and 14, to their grand parents (mother's parents). They both changed their family name to Elhanan in 1944 when they thought that we perished (that is a separate story). My parents did not change their family name Rabinovitz. Onfortunately my brother Binyamin fell in our Independence War on July 18th 1948. My eldest brother Amos passed away in 1965 from leukemia, at the age of 65, leaving after him a widow and two children. My two brothers were born in Berlin in 1925 and 1926 where my parents met and married. They moved to Kovno, after my father finished his studies as DrPhil. in Chemistry with Prof. Fritz Haber. We are descendens of Binyamin the youngest son of Rabi Itzhak-Elhanan Spector, the Gaon of Kovno, who was murdered at the family home on Gardino street in Kovno in 1906. I am fifth generation of the Gaon who is my Great, Great Grandfather. Our family was imprisoned in the Ghetto of Kovno, from 1941 to 1944, then we were deported to the Camps in Germany. My mother was separated frm us to the KL Sttuthof and was released by the Red Army on March 10 1945. My father and I were imprisoned in Kaufering Camp One, which belonged to KL Dachau.We were releasedby the Japanese unit of the US Army on May 2nd 1945 in Waakirchen bei Hauserdorfl in Bavaria near Bad Tolz. Fortunately we met in July with my brother Amos, a soldier of the Jewish Infantry Brigade Group from Palestine, and with our mother, at the boarder in Italy. On 8th of November 1945 we reached Palestine as legal new comers. We will be happy to hear from you and to tell you moreand we invite to be our guests in Rehovot. Best regards to your family and to Regina in Vilnius. 1. Binyamin the youngest son of the Gaon was killed by a robber, who was the son of the laundress who worked with the family, and therefore was let into the house. He is buried with his wife, who died in 1929, in the cemetery on the "Green Hill" in Kaunas. 2. To the best of my knowledge, and stories told at home, the reason for the family name change was the following: At a population census the Russians who performed it have asked who are the children playing in the yard. They were told that they are the children of the Rabbi and therefore registered them as Rabinovitz (children of the Rabbi in Russian). So the reason for the name change is not mobilization to the Russian Army. 3. My brothers changed their family name after the name of our father. But their excuse to our Grandfather, who told them that the Ashkenazi community, does not name after people that are alive, was that they named themselves after the great, great grandfather the Gaon of Kovno. 4. My wife works at the Department of Biochemistry, and did not know your father. 5. I did receive the e-mail of your brother Dan, and in our case our son is a fifth generation cousin of your children. I would like to add to our phone conversation the following in writing: Rabbi Itzhak-Elhanan Spector with his son Rabbi Zvi-Hirsh Rabinovitz are buried in the active cemetery in the suburb Aleksotas (across the Niemunas river). They were transferred to Aleksotas in 1984. The wife of the Gaon, and his son Binyamin with his wife Dvora remained buried on the Green hill (see 1. above). I have repaired the gravestones of Binyamin, his wife Dvora and my grandfather Israel-Isser Rabinovitz during my first visit to Lithuania . Among the Spektor descendants who have not gotten much coverage here, at least so far, is Bluma Salomonson, the daughter of YES son Benyamin Rabinowitz, who was one of the first members of the Spektor family to go to Palestine. Here she turns up in the academic paper in Tradition. The author cites a chapter about YES written by Samuel K. Mirsky in the 1958 book Guardians of Our Heritage (New York: Bloch Publishing Company, 1958), which evidently contains excerpts from a memoir by Bluma in which she recalls going to a summer resort with her grandfather, the great rabbi. The reference to the Bluma material in the Tradition article is shown below. 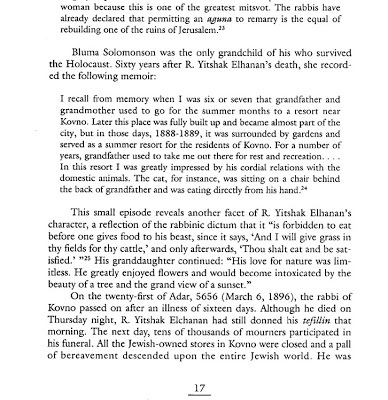 Besides its depiction of the kindly rabbi feeding a cat, and Bluma's comment that "his love for nature was limitless" (both characterizations that strike a chord), the really interesting thing is the uncategorical first sentence: "Bluma Solomonson was the only grandchild of his who survived the Holocaust." Of course we know this is not true. We know that Benyamin Rabinowitz's grandson and his family survived the Holocaust, but Benyamin's son Israel Isser, Shmuel's grandfather, died in Kovno before the war. We think there is another sister of Bluma and Israel Isser, Yetyl, who lived in Kharkov, Russia, and we don't know her life story. The obvious conclusion is that Rakeffet-Rothkoff, like other Spektor biographers, knows nothing of the later life of Joseph Rabinowitz. That may not seem surprising except that the author is affiliated with REIT at Yeshiva University. Walter has a theory that Joseph was involved with a group of American followers of Rabbi Spektor. In the paper, Rakeffet-Rothkoff writes about the group under Rabbi Moses Mayer Matlin that founds the yeshiva named for the rabbi in 1897, which eventually evolves into Yeshiva University. Presumably, if Joseph Rabinowitz had something to do with Rabbi Matlin's project, the historians at Yeshiva University would know something about him. Yet it seems that they don't. So I don't know where that leaves us concerning Joseph's religious activities in New York. 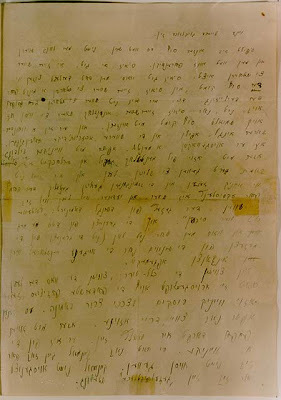 Among the artifacts in the Hidden History of the Kovno Ghetto is a photograph of Shulamit Rabinovitch's June 1944 letter to her sons in Palestine. The photo is credited to Shmuel Elhanan. It is interesting that the date is given here as June 27, not June 6 as in the Ethical Wills book. The caption includes this information: "Shulamit Rabinowitz was deported with her husband and child. They survived camps in Germany and eventually were reunited with their family in Israel." With the new date information and the timeline, we can now place the letter as having been written 12 days before the start of the week-long liquidation of the ghetto, when the remaining population was rounded up for deportation to Stutthof and Dachau concentration camps. See below review of Hanoch Bartov's Beyond the Horizon, Across the Street sent to me earlier today by Dan, after we learned of the book in an email from Shmuel Elhanan. At its core, the book is a history of the Spektor-Rabinovich-Elhanan family from the days of the Gaon of Kovno to World War II and the Holocaust. It tells the story of the two older Elhanan boys, Amos and Binyamin, who had moved to Palestine as youths in the 1930's and who Bartov came to know as comrades in the Jewish Brigade in World War II. The family was reunited after the war when Amos found them in a refugee camp in Italy, having miraculously survived the Holocaust in the Kovno ghetto and the death camps. Unfortunately, the book itself is only in Hebrew. Just reading about it is very powerful as it so palpably connects our own family with the larger sweep of Jewish history of the past 150 years from Isaac Elchanan Spektor and the shtetl through the horrors of the Holocaust and the emergence of the Jewish state. And, of course, the review helps to answer many of the questions Dan and I had for Shmuel whom we hope to interview by phone in the coming days, though there will be plenty more to ask him. The excerpt follows. Go here for the original. 2006: In an article entitled “Another Page from an Epic Chapter,” Danny Rubinstein reviewed Mihutz laofek, mi'ever larehov (Beyond the Horizon, Across the Street) by Hanoch Bartov. "In 1943, at the age of 17, Hanoch Bartov, a native of Petah Tikva, joined the Palestine Regiment of the British Army, which was fighting Nazi Germany and which features prominently in his novel "Pitzei Bagrut" ("The Brigade"). In the Jewish soldiers' barracks at the end of World War II, one heard tales of emotional encounters between a Jewish soldier and a member of his family who had survived the Holocaust. At the time, Bartov heard, but did not have a strong recollection of, one story. It was about a man named Amos who had immigrated to Palestine, joined the British Army's Jewish Brigade and found his parents and younger brother, who had been in a displaced persons camp in Italy and had miraculously survived. After the war, Bartov moved to Jerusalem, spending much of his time with a group of university students who were commanders in the Haganah (pre-state militia). One of them was Binyamin, nicknamed "Rabi," who was killed during the summer of 1948 in a battle in the Negev. Rabi was Amos' brother and he was also astounded to learn, after the war, that his parents and younger brother had survived the Nazi inferno after being thought dead for some time. Many years later, in May 1978, on the morning of Israel's 30th Independence Day, the telephone rang in Bartov's home. He was busy completing a biography of David "Dado" Elazar, chief of staff during the Yom Kippur War, whom many see as one of its victims. The older man on the other end of the line introduced himself: "I am Rabi's father." The reason for the call was the obituary Bartov had written about Rabi and the members of his generation - the "1948 generation," who fell in the War of Independence. Bartov recalls that he was surprised to hear from the bereaved father. "I was thunderstruck," he wrote. Following the telephone call, Bartov felt he must continue writing about and preserving the memory of his many comrades-in-arms who had died in that cruel year of 1948. That call thus led to a connection spanning many years, between Bartov and the two parents who were Holocaust survivors. He began visiting their North Tel Aviv home and heard about their experiences in their native city of Kovno in occupied Lithuania. He interviewed relatives and friends of this couple, and perused letters and memoirs. The result is "Mihutz laofek, mi'ever larehov" ("Beyond the Horizon, Across the Street"), which has appeared 25 years after the conversation with Rabi's father and presents one East European Jewish family's fascinating story. The family's life revolves around the destruction of Europe's Jews and Israel's establishment - namely, what is sometimes termed "Holocaust and rebirth." "Holocaust and rebirth" is an epic chapter in Jewish history, although many consider it to be an overused, anachronistic topic. Bartov relates the saga of an intriguing family that enjoyed considerable social status and whose history he finds moving. He has been able to convey some of that emotion to his readers. Although he avoids excessive emotionalism, some passages will cause the readers to feel goose bumps and a lump in their throat. The family is Rabinowitz-Elhanan. The father, Yitzhak Elhanan, was a descendant of Yitzhak Elhanan Spektor, a prominent 19th-century Jewish leader who was Kovno's chief rabbi under the Russian czarist regime. In 1924, in Berlin, Yitzhak married Shulamit Rosenblum, daughter of a wealthy Jew who was proud to be a descendant of the great Rashi, loved Zion and was related to Israel's third president, Zalman Shazar, and to supreme Court chief justice Dr. Moshe Zmora. While Yitzhak and his wife remained in Kovno to manage their extensive family business, Shulamit's elderly parents moved to Palestine in 1933, investing in private property and orchards (for example, the Rosenblum orchard, site of the present-day Givat Shmuel, adjacent to the Geha Highway). Their three sons were born in Kovno: Amos (1925), Binyamin "Rabi" (1926) and Shmuel (1930). When World War II broke out, the parents sent the two older sons to Palestine, where they grew up with their maternal grandparents in a spacious apartment on Tel Aviv's Rothschild Boulevard. The parents and their youngest son remained in Kovno. Although Holocaust scholars are familiar with the story of the Kovno ghetto, readers will be stunned by the eyewitness reports on the insane cruelty of the Nazis and the masses of Lithuanian collaborators there. The book introduces us to a previously unknown document from the ghetto: a letter from the head of the Juderat, Dr. Elhanan Elkes, who considered it to be his last will and testament. He wrote it in Hebrew two days before his deportation to Dachau, where he later perished, and sent it to his children in London. Preserved by a Holocaust survivor, this letter describes the events leading to Elkes' appointment as Judenrat head and notes how, with "shaking, worried hands," he and the other Judenrat members tried to steer the "mad ghetto boat in the middle of the ocean" to save as many Jews as possible. Elkes addresses his son Yoel: "My beloved Yoel! Be a loyal son to your people! Concern yourself with the welfare of other Jews, not with the welfare of the gentiles. In our long exile, they have not given us even a fraction of what we have given them. Try to settle in Palestine." Elkes' children did not settle in Israel, but instead made their homes in the United States and England. Bartov believes this is the reason why they avoided publishing their father's last will and testament for so many years. Along with the letter, Bartov summarizes the debate in the Israeli public on the role of the Judenrats (many books and research studies exist on this topic). In addition, he presents not only the memoirs of Elhanan and Shulamit; he also describes the adolescence of their sons Amos and Binyamin. The drama's climax is the chance meeting between Amos, a soldier in the Jewish Brigade, and his survivor-brother Shmuel. Amos was looking for his parents (who were separated when the ghetto was liquidated and did not know the other's whereabouts) and arrived one day in Pontebba in northern Italy to meet a friend. That evening someone told him that a truck had just come in from Munich "and there might be somebody there who has heard something about your father." Amos approached the truck and that very moment Shmuel, his younger brother, jumped to the ground. Although in this passage Bartov tries to offer a simple description, without emotional clichés, there will almost certainly be a tear in the reader's eye. Rabi, Bartov's comrade, was killed in 1948. Amos died from a fatal illness at age 40. Shmuel, who immigrated with his parents, fought in the War of Independence, serving with the elite Palmach strike force and participating in the battle of Malkiya. He may have been one of the "last ones on the ridge," to use a term coined by Yitzhak Tischler, who describes the battle in a book and is also mentioned by Bartov. Shmuel accompanies Bartov on his meetings with Shmuel's parents.